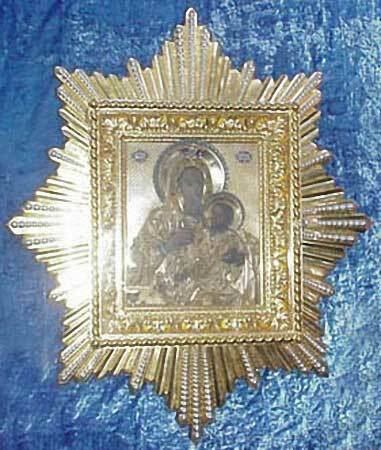 The Kozelshchansk Icon of the Mother of God was glorified in the late nineteenth century, though it is older than that. This icon is of Italian origin and was brought to Russia by one of Empress Elizabeth’s (1741-1761) maids of honor, who was Italian. The owner of the icon married a records clerk of the Zaporozhsky-Cossack army, Siromakh. So, the icon went to the Ukraine with them. During the nineteenth century it belonged to the family of Count Vladimir Kapnist, and was one of their sacred possessions. The icon was in the village of Kozelschina, Poltava governance. During Cheesefare Week in the year 1880, Maria, the daughter of V. I. Kapnist, dislocated some bones in her foot. The local doctor said the problem was not serious. Dr. Grube, a noted surgeon in Kharkov, agreed with the diagnosis, and he applied a plaster cast to Maria’s foot. He also prescribed hot baths and iron supplements. To lessen the discomfort of the foot while walking, a special shoe was made with metal bands that went around the girl’s leg. Lent passed, but the girl did not feel any relief. After Pascha, Maria’s other foot became twisted. Then both shoulders and her left hip became dislocated, and she developed pain in her spine. The doctor advised Count Kapnist to take his daughter immediately to the Caucasus for the curative mineral waters and mountain air. The journey to the Caucasus and the curative treatments caused even greater affliction. The girl lost all feeling in her hands and feet, and did not even feel pinches. Because of the advanced degree of the illness, and since therapy was not helping, they were compelled to return home. In the month of October, the father journeyed with his sick daughter to Moscow. Here he consulted specialists, who declared that they could do nothing for Maria. The parents and the sick girl began to despair. However, an unexpected opportunity for help from a foreign professor presented itself. Since it would be some while before his arrival in Moscow, the sick girl asked to return home. The Count sent her back to the village, and his wife promised to bring their daughter back to Moscow when he received news of the the professor’s arrival. On February 21, 1881, they received a telegram saying that the professor had arrived in Moscow. The girl, who had no confidence in earthly physicians, placed all her hope in God. This icon had long been known as wonderworking. According to tradition, young women would pray before it to have a happy family. It was also the custom to clean the cover of the icon, and the one praying would wipe it with cotton or linen. Pressing the holy icon to her bosom, the sick girl, with the help of her mother, cleaned it and poured out all her sorrow and despair of soul to the Mother of God. All at once, she felt the strength return to her body and she cried out loudly, “Mama! Mama! I can feel my legs! I can feel my hands!” She tore off the metal braces and bandages and began to walk about the room, while continuing to hold the icon of the Mother of God in her hands. 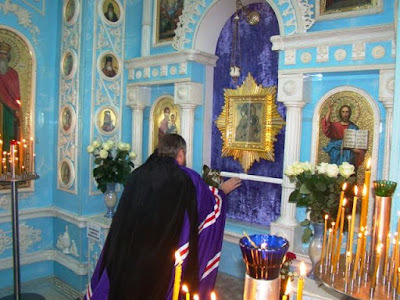 The parish priest was summoned at once and celebrated a service of Thanksgiving before the icon. The joyous event quickly became known throughout all the surrounding villages. The Countess and Maria went to Moscow and took with them the holy icon of the Mother of God. News of the healing quickly spread about Moscow and people began to throng to the hotel, and then to the church, where they had brought the icon. The icon continued to work several more healings. 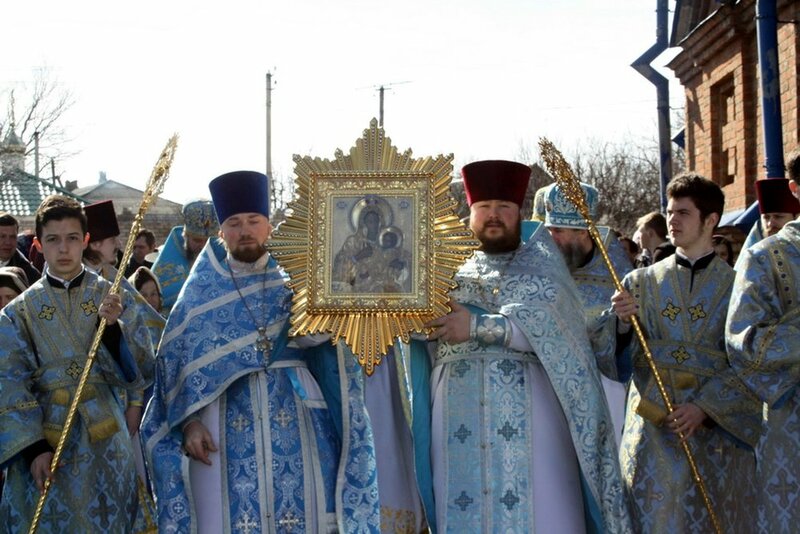 When the family returned home to Kozelschina, people had already heard about the miracles of the Kozelschansk icon of the Mother of God in Moscow, and many came to venerate the icon. It was no longer possible to keep the icon at home, so by the order of Archbishop John of Poltava, the icon was transferred to a temporary chapel on April 23, 1881. Every day from early morning, services of Thanksgiving and Akathists were served before the icon. In 1882 a chapel was built on the grounds of the estate, and then a church. By decision of the Holy Synod on March 1, 1885 a women’s monastery was established, and on February 17, 1891 it was dedicated to the Nativity of the Most Holy Theotokos. 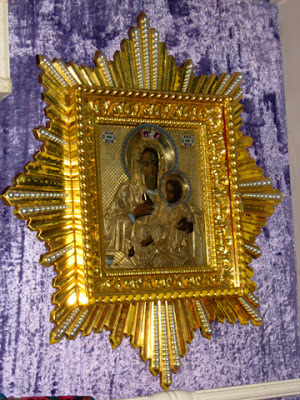 The Kozelschansk Icon was in the Krasnogorsk Protection Convent (Kiev diocese) after 1929 when he Nativity of the Theotokos Monastery was closed by the communists. It was returned to the Nativity of the Theotokos Monastery in Poltova with much festivity in 1996. In the lower left corner of the icon is a table with a cup and a spoon. It is believed that this symbolizes the Mother of God as a “bowl for mixing the wine of joy” (Akathist, Oikos 11). A Service and an Akathist have been composed for the Kozelschansk Icon.